GOT .99 cents to spare? Want to help a military vet get a service dog? 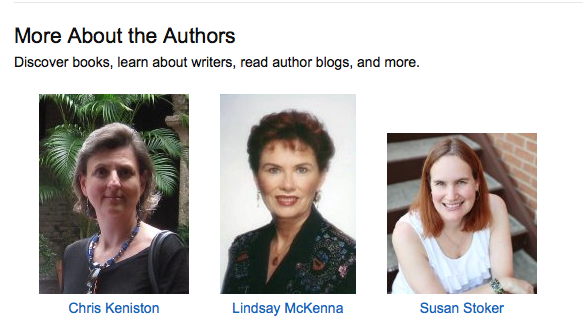 Want three great books by Lindsay McKenna, Chris Keniston and Susan Stoker in trade for that .99 cents? Want to feel good? 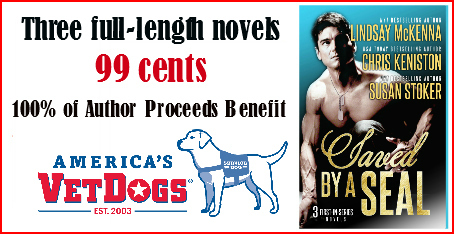 Spend .99 cents today and help a military vet get a service dog to help them through their daily life! SAVED BY A SEAL is an anthology comprised of three books, all “First in series” by us. You will find Nowhere to Hide in the book, but even if you’ve already read it, there are 2 other books (Aloha Texas by Chris Keniston and Saving Caroline by Susan Stoker) that are AWESOME inside! And the BEST thing about this is that ALL Author Proceeds to benefit DISABLED VETS via the Service Dog program America’s VetDogs. Yup. We aren’t making a DIME on this. So please, even just to support VetDogs, even if you don’t care about the stories, can’t you spare a buck? This is something so much more important! Less than the cost of a cup of coffee! Your money goes for a service dog that will be given to a vet! Read more about America’s VetDog at vetdogs.org and see what a wonderful job they’re doing for our Veterans. You are currently browsing the archives for the Service Dogs category.